Done well, a webinar can help you move your buyer’s sales needle from “just researching” to “ready to buy now.” In the latest CMI research, two-thirds of B2B marketers used webinars and 66% found them to be effective. As with any well-produced event, success starts with planning. For a demand-generation webinar, it should take about six to eight weeks from the time you say “let’s go” to show time. Now, let’s get on with this show and the five acts of a successful webinar. A webinar is about more than just technology. It’s about aligning business drivers with desired outcomes all while managing the ever-changing scheduling, logistics, and human factors. The glue that holds all of this together is a deadline-driven project-management methodology, a set of best practices, and use of email and webinar metrics to benchmark performance across the entire webinar life cycle. Each act’s objectives and task checklist offer you a strong basis for a successful methodology. Determine webinar objectives and desired outcomes. Identify technology tools and team skills needed. Build a project plan and successfully kick this off. Determine the content type: case study, tutorial/how-to, or compliance and standards. Identify audience pain points this webinar addresses. Consider if this a “must-have” or “nice-to-have” topic. Determine the call to action (before, during, and after the webinar). List success factors and desired outcomes. Determine when to go live. Identify who will be part of the project team. Determine whether internal and/or external speakers will be used. Evaluate which webinar hosting platform will be used. Determine hosting platform compatibility/integration with marketing automation tools. Hold a kick-off meeting to set the tone with all players. Follow up the kick-off meeting to get buy-in and start the production. Develop the email invitation and email campaign schedule. Identify list-sourcing options beyond your house list. Select a winning topic that connects with your target audience (e.g., solving a pain point, describing how to get better outcomes, or keeping the audience in the know with industry and market shifts). Develop an audience profile to align with the topic and value proposition. Detail industries, job titles/functions, revenue thresholds, and geographic regions of your audience. Size and source your audience beyond your house list to meet your registration goals. Identify list-sourcing options (e.g., media sponsors, trade associations, purchased lists). Determine the email invitation format: HTML, text, or both. Ensure that the email invite addresses the problem statement and deliverables of what people will learn. Develop the webinar registration landing page (webinar hosting or marketing-automation platform). Create the email campaign drip schedule (how many and when to start). Develop attention-getting email subject lines for each drip. Establish benchmark metrics for the email campaign and daily registration tracking. Make sure emails are CAN-SPAM compliant. Identify social media promotion channels. Test email and social media campaigns before launching. Execute the email marketing campaign and start daily tracking of registrations. Use email and registration metrics to determine whether the message is connecting to attract the desired audience and registration outcomes. Gather and convert registration data into actionable intelligence. Hold a table-read meeting to brainstorm structure and flow. Hold the first dress rehearsal to perform the initial walk-through. Monitor the key email webinar invitation metrics (sent, hard bounces, soft bounces, delivered, open rate, click rate, unsubscribes/opt-outs, and spam complaints). Gather and analyze additional registration data from the landing page (e.g., what you can learn about the organization, industry, and job function; what would they like to get out of attending the webinar; how did they hear about this webinar?). Create a dashboard to view daily registration tracking progress (e.g., email campaign metrics by touchpoint, audience demographics, and daily registration by touchpoint including CTR metrics). Monitor campaign metrics to see if they are on track and adjust the campaign messaging, if necessary. Consider getting fence sitters (those who opened email but did not complete registration) to commit by sending reminder emails. Schedule one hour for the table read of the webinar. Prepare and send the table-read meeting agenda for key organizers and speakers. Ensure that webinar content matches the invitation. Discuss structure, timing, and flow. Create a production script – identify each segment, duration, and speaker. Prepare PowerPoint slides and template. Make sure speakers have appropriate audio devices, supply them with a USB headset, if needed. Schedule 90 minutes for the first dress rehearsal. Prepare and send the first dress-rehearsal agenda. Share insights gathered from daily registration. Modify and optimize the content, as needed. Test speakers and audio devices. Begin development of questions for online polls (ice breaker, closing, and next steps). Schedule 90 minutes for the second dress rehearsal. Create six bookend slides – splash screen, speaker intro, who’s in the audience, housekeeping, call to action, ask the experts. Create the final survey to measure satisfaction and other qualitative feedback. Draft thank-you emails for all attendees and no-shows with a link to view the webinar and any other next steps to continue the conversation. Perform a timed run-through of the slides and polls (ice breaker, closing, and next steps). Create seed questions for the Q&A. Does the story sound natural and authentic? Perform the final sound check. Execute immediate post-webinar action steps. Meet with your team one hour before the webinar. Review the slide deck one last time. Make sure polls, survey, and seed questions are loaded into the webinar platform. Set up a Plan B – back-up audio and network. Record the webinar and assign two people to create a backup recording. Give team a debriefing number to call after the webinar. Launch the splash screen at least 15 minutes before going live. Silence all ringers and anything that can beep or bark. Send a welcome message to audience one to two minutes before starting the broadcast. Start on time, welcome the audience, and have fun. Monitor real-time tracking of performance metrics to measure engagement. Deliver a clear call to action and next steps to your audience one to two minutes prior to adjourning. End on time, and thank the speakers and the audience. Get on a separate call for a 15-minute team debrief. Edit the webinar recording to remove housekeeping instructions and any ums and ahs. Send thank-you emails 24 to 48 hours after the webinar. Prepare the final metrics and analytics. Convert the analytics into actionable sales follow-up. Gather the final life-cycle data from the marketing-automation platform and webinar hosting platform. Analyze the six key webinar metrics: click-through ratio, attendee ratio, online polls, audience retention, exit surveys, and on-demand viewings. Create a report with a narrative of the final metrics (e.g., email and registration metrics, daily registration tracking summary, polls and surveys, lead sources profiles, attendee details, and email campaign results). Develop an actionable executive summary. Determine who is sales-ready, who needs nurturing, and who is not a fit. Hand off the sales-ready leads to the sales team. Create a post-webinar nurturing campaign. Determine whether initial planning goals were met. 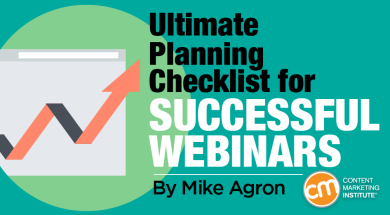 Evaluate how effective the webinar was in meeting your commercial goals. Determine if there is enough interest for a second webinar or a series. I am confident that if you follow this template, along with your own best practices, you will achieve your commercial demand-generation outcomes while adding value to your audiences. Looking for more ways to maximize the impact of your webinar/virtual conference? Get practical insights, advice, and answers in our 2018 Guide to Essential Content Marketing Tactics.